Flag of the Border Service of the FSB since 2003 and Border Troops of the Federal Border Service till 2003. Federal Border Service flag till 2003. Flag of the Coast Guard of the Border Service of the FSB. The Border Service of the Federal Security Service of the Russian Federation (Russian: Пограничная служба Федеральной службы безопасности Российской Федерации) is a branch of Federal Security Service of Russia tasked with patrol of the Russian border. The terms Border Service of Russia (Russian: Пограничная служба России) and Border Force of Russia (Russian: Пограничные войска России) are also common, while in English, the terms "Border Guards" and "Border Troops" are frequently used to designate this service. The Border service numbers around 170,000 active members, which includes the Russian maritime border guard units (i.e., the coast guard). One can trace the origin of the Russian border service to 1571 and the work of Prince Mikhail Vorotynsky (died 1573) and his Great Abatis Border built along the southern boundaries of the Tsardom of Russia in the 16th century. In 1782 the Empress Catherine II of Russia established Border Customs Guard units, originally manned by Russian Cossacks as well as by low-ranking cavalry troops. In 1810 General Mikhail Barklay de Tolly organized numerous border posts along the entire western Russian border, manned by 11 regiments of Don and Bug Cossacks . Within two years Russian Border Guards became the first to oppose Napoleon's invasion of Russia (June 1812). In 1832 Cossacks and cavalry were replaced by armed customs officials subordinate to the Ministry of Finance in peacetime (in wartime the border guards were automatically transferred to the army). In the same year the government of Emperor Nicholas I established a coast guard - originally to observe coasts of the Black Sea and of the Sea of Azov. Count Sergei Witte, the Russian Minister of Finance (1892-1903) in the government of Alexander III (reigned 1881-1894), reformed the service on 13 October 1893 into the Independent Border Guards Corps (IBGC - a para-military rather than a civilian organization) headed by an army general and reporting directly to the ministry. In 1906 about 40,000 soldiers and officers served in the IBGC - maintaining the defence of the lengthy Imperial border. They served in 8 division-sized districts as well as in the Saint Petersburg headquarters unit. Soviet Border Troops, (Russian: Пограничные войска СССР, Pogranichnyie Voiska SSSR) were the militarized border guard of the Soviet Union, subordinated to its subsequently reorganized state security agency: first to Cheka/OGPU, then to NKVD/MGB and, finally, to KGB. Accordingly, they were known as NKVD Border Troops and KGB Border Troops (with Russian abbreviations - НКВД СССР/- КГБ СССР added on the end of official names). Unlike border guards of many other countries, Soviet Border Troops were a centralized force including also the maritime border guard units (i.e., a coast guard). Following the collapse of the Soviet Union, Federal Border Guard Service of Russia was created on December 30, 1993 as a separate government agency. The agency retained some old traditions, most notably the dark green-colored uniform and "Border Guarder's Day" (an official holiday commemorated by celebrations of ex-servicemen). First minister of FBS (Federal Border Service) was Andrei Nikolayev, young and outspoken general who later became deputy of the State Duma. Russian Border Guards were also stationed outside of Russia most notably in southern Tajikistan, in order to guard the border with Afghanistan, until summer 2005. On Afghan-Tajik border on many occasions they were engaged in heavy fighting with drug-traffickers and Islamic extremists. Armenia's closed border with Turkey and open border with Iran is also still guarded by the Russians. On March 11, 2003, Russian president Vladimir Putin changed the status of Border Guard Service from a separate agency into a branch of Russian Federal Security Service. The current head of Border Guard Service of Russia is General Vladimir Pronichev. Border Guard Service of Russia is tasked with a defence of the longest national border in the world. In April 2012 Vladimir Pronichev announced that the country was planning to build 20 frontier posts in the Arctic region. Reasons for this development can be found in the increased abilities to explore hydrocarbon deposits in the north. It will also give Russia an ability to patrol and service the Northern Sea Route. In July 2014 Ukraine opened a criminal case against the head of the Border Guard Service Vladimir Kulishov; he was accused of financing “illegal military groups” in Eastern Ukraine who at the time fought against the Ukrainian army. Defence of the Russian national border, prevention of illegal crossing of the land and sea border by people and goods (smuggling). Protection of economic interests of the Russian Federation and its natural resources within land and sea border areas, territorial waters and internal seas, including prevention of poaching and illegal fishing. Combat any threats to national security in the border area, including terrorism and foreign infiltration. Changes in the regional structure of the Border Service, instead of ten regional border (see the old structures FPS) for the new scheme includes regional offices of the border (in the federal districts) and 30 border offices. Includes the Maritime Border Guard. Parts logistics, technical, and other support. In December 1991 - after the reorganization of KGB, the General Directorate of Border Troops were abolished and formed the Committee for the Protection of the State border of the Soviet Union with the Joint Command of the border forces led by was assigned to the post of chairman of the Committee - Chief of Soviet border troops. In 1992 - a Border troops of the Russian Federation, which have been subordinated to the Ministry of Security. In 1993 - Federal Border Service - General Command of Border Troops of Russian Federation with the status of federal ministries. In 1994 - renamed the Federal Border Service (FPS Russia). 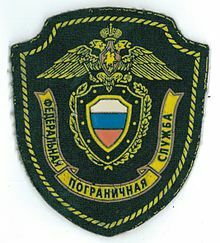 4 May 2002 - FPS Russia renamed the Border Service of the Russian Federation, which consists of specially authorized federal executive body for the Border Service (FPS Russia), troops and other organizations. ^ "Paper" (PDF). info.publicintelligence.net. 2017. ^ "Russia to create 20 frontier posts in Arctic". Russia & India Report. 16 April 2012. Retrieved 29 April 2012. ^ "Ukraine calls businessman and Russian defense minister 'accomplices of terrorists'". wqad.com. 22 July 2014. ^ "Ukraine opens criminal case against Russian Border Service chief - Xinhua - English.news.cn". Xinhua News Agency. Wikimedia Commons has media related to Border Guard Service of Russia. This page was last edited on 11 March 2019, at 10:24 (UTC).